Right around the end of last year I went to my favorite farm wool shop and there was a pile of one of my most-loved fibres on sale. 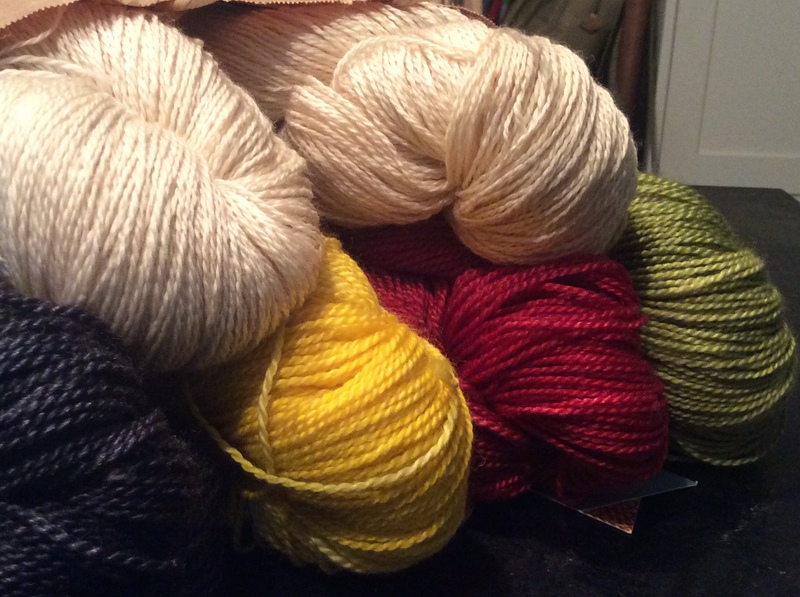 It was deeply discounted, so I grabbed quite a few skeins. I do this a lot – I get the wool, and then just kind of play with it – the color, the texture, the feelings it evokes. There’s a lot of serendipity in it – it depends on what’s available that day, the light in the store, my mood… what’s on sale. This is, in many ways, one of my favorite parts of the creative process . It is difficult to parse the steps in this sort of decision making, but it’s good to learn to recognize that quickening one gets when one is on the right track. I do know that when I ignore my hunches in these matters, I usually end up with something that I do not find entirely pleasing. 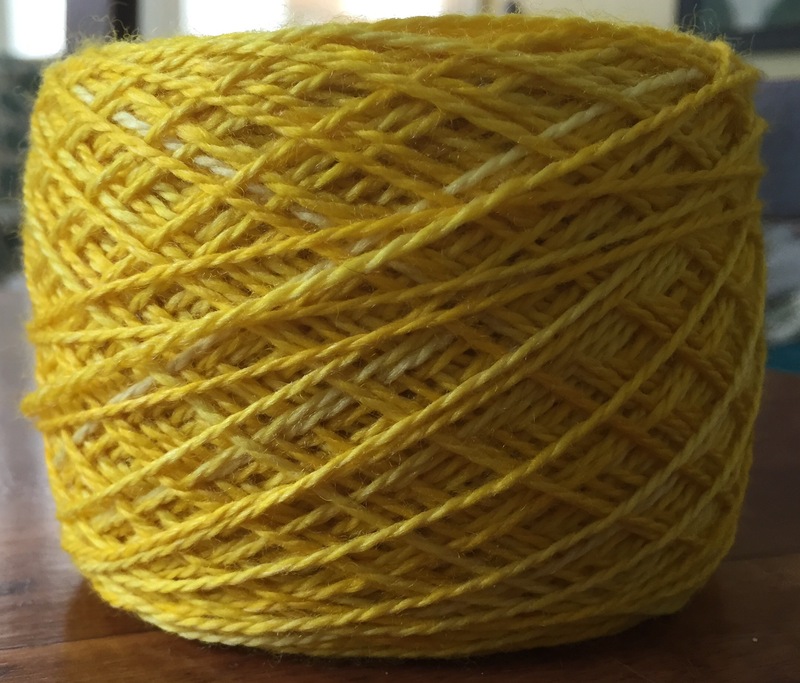 With this particular addition to my stash, I had no real idea of what I would do with it, but I had picked up a color I don’t usually use – yellow. That bright yellow skein, through whatever alchemy of mind and memory, made me think of Hudson’s Bay blankets. So I made sure to pick up the other colors necessary for that classic design and decided to create an homage. I say that because I’m fairly sure there’s a copyright of some sort on using the term “Hudson’s Bay”…. what I wanted to make was something that would evoke those same feelings that the iconic design would do – it’s Canadian, retro, and instantly recognizable. So, I went home and had those skeins and had an idea, and was inspired. It was glorious, and I knew JUST how it would look and feel to work with it, and wear it. I had images of a whole series of pieces using this theme. It was going to be so great. Then I went on holiday for three weeks. Step… on in, the water is fine! 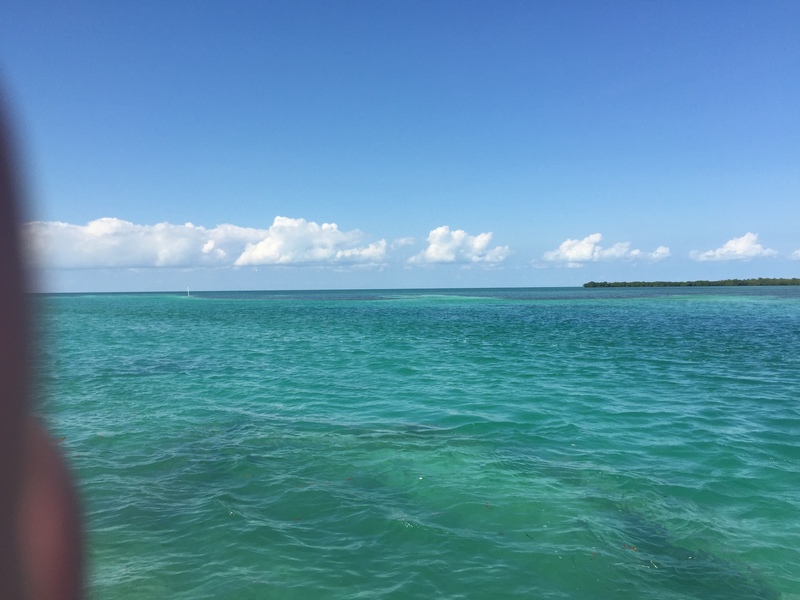 When we arrived in Belize, the palette was completely different. The seasons and plants around me in Canada had been preparing me slowly for the inevitable winter: greys and browns and muted colours. Indirect sun, the somewhat mixed joys of bright red parkas and new mittens. That’s where I was in my head, and that’s how “Hudson’s Bay” instead of “Sunlight” came to my head when I saw yellow wool. So. Once back home and happy from the holiday, but a little run down from being ill while away – Belizean germs are tenacious – I returned to my planned homage to Hudson’s Bay and in a burst of energy (some of it, perhaps, drug-induced?) I warped the loom and set to work. 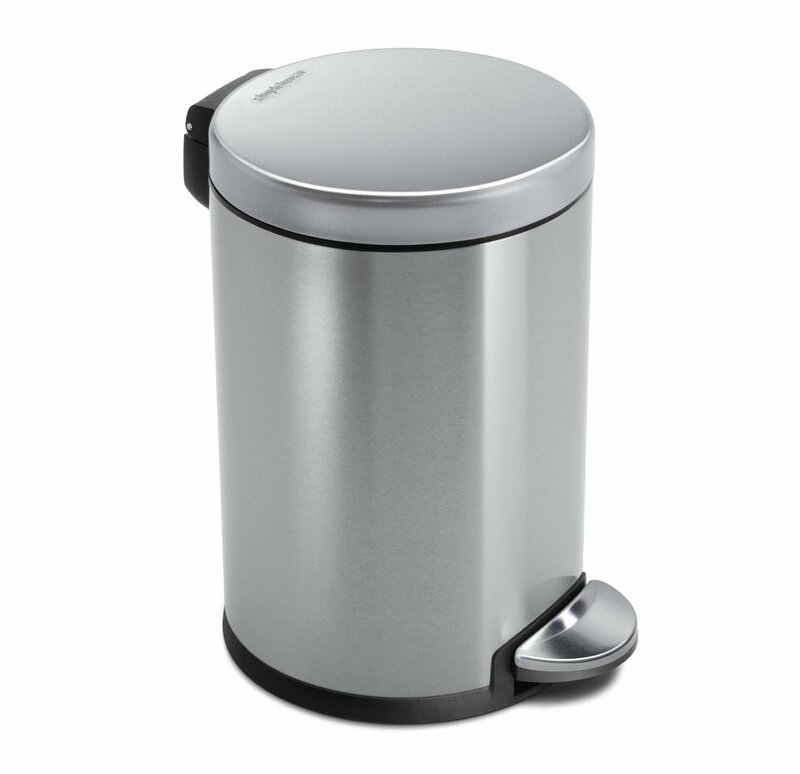 And here’s the thing. You can have all the inspiration in the world, and have terrific seawool yarn (a mix of merino and sea cell) in the right colors and at the right price. You can have time and space and desire. But unless all of it “works” in that indefinable way that makes something a successful design idea, you’re in trouble. I warped the loom quickly and with less attention, perhaps, than usual. Hey, I’ve done this a million times….this is old hat, right? Step 3: Know when to stop. Don’t waste a bunch of time overthinking it. Just get rid of it and move on. I chose the wrong reed and the warp (the vertical threads) just didn’t look right. 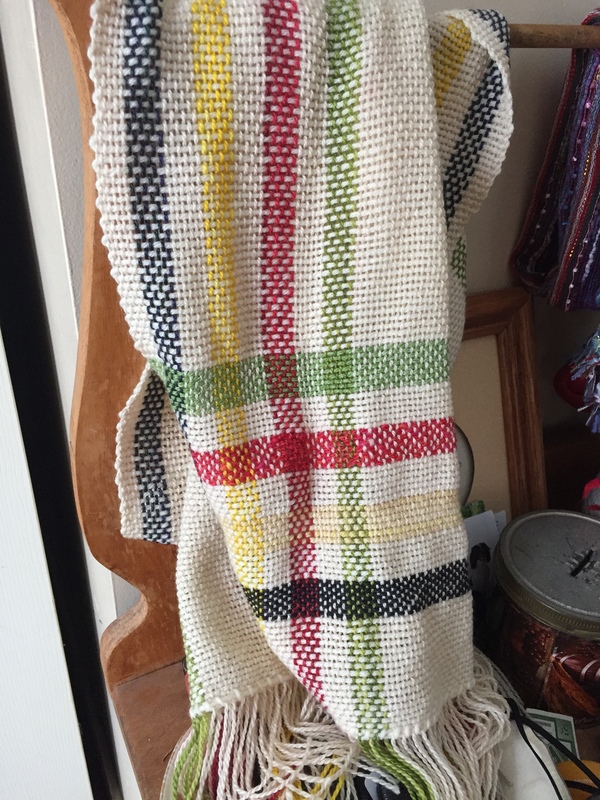 I didn’t think it through, and started weaving – hoping it would sort itself out. I cut off the weft I’d woven in, twice. I tried different colors, different textures. Nothing looked right, somehow. So, a third time I unwove (is that a word? ), and with very little grace or hope of success I grabbed a giant ball of acrylic (ptui!) that I’d bought at a big box store a while ago. I don’t even know why I bought it – I don’t usually work with acrylic because I am a bit fibre snob and like to use natural fibers. I make a point of looking for locally sourced fibres and get a lot of pleasure out of them. I tend to sneer a bit at acrylic. I wound some of the acrylic, and wove some in. And it worked! It is lightweight drapes beautifully. I made it very wide and so one needs to make sure it will fold and drape without feeling too inhibiting. it’s warm and drapey and I love this scarf. 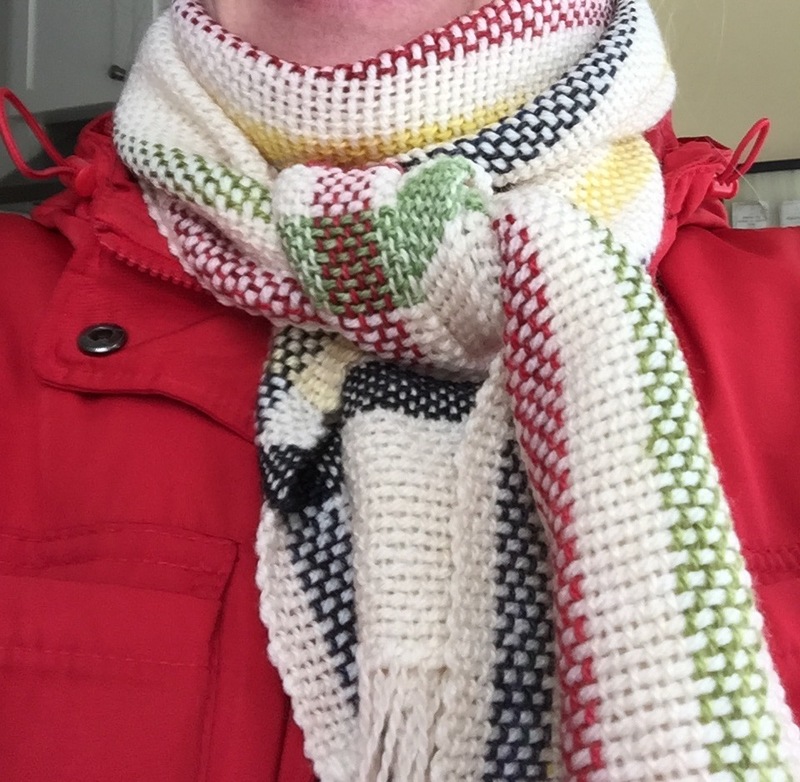 You will love this scarf. 12″ wide x 5.75 feet long. Turns out that acrylic ain’t all that bad, especially when you mix it with other nice things and it’s the right weight/scale/texture for the piece. It will also keep the price of the scarf at a rational level. Step 5: finish it, and see what you’ve got. Because I was suffering from a Belize-related lack of focus, this particular scarf is only good for my neck. There are irregularities in the weave, and I had to repair some bits and while I cannot deny that it looks great, you kind of have to… squint, just a little in order to make it so.